The full details on the new GM / BMW / Mercedes hybrid system! The Two-Mode Hybrid developed by the Global Hybrid Cooperation group is a full hybrid system that enables significant improvement in composite fuel economy while providing uncompromised performance and towing capability. In city driving and stop-and-go traffic, the vehicle can be powered either by the two electric motors or by the combustion engine, or both simultaneously. The Two-Mode Hybrid can also drive the vehicle using an input power-split range, a compound power-split range or four fixed-ratio transmission gears. The system is flexible and efficient, with smaller motors, inverter module and battery that enable numerous cost advantages. Many types of hybrid systems were explored by the partners of the Global Hybrid Cooperation in establishing the Electrically Variable Transmission (EVT) as the basis for the cooperation. EVTs are currently the dominant hybrid systems in the market place [ie in Toyota vehicles and those using Toyota licensed technology] and possess a number of attractive attributes that contribute to this leading position. One of these attributes is smooth and continuous regenerative braking. This maximizes the ability to recoup vehicle kinetic energy during deceleration meeting the high standards for refinement of luxury brands. Another benefit of the EVT is that it has the ability to continuously vary the speed of the engine, like the mechanical Continuously Variable Transmission (CVT). The EVT can also store energy electrically in a battery. The CVT action combined with the ability to store energy electrically offers the unique opportunity to maximize overall system efficiency by enabling the operation of the engine at optimal speed and load points. The ability to manipulate the operation of the engine in this fashion is also synergistic with the cylinder deactivation systems, thus allowing the engine to increase operation with deactivated cylinders, thus reducing fuel consumption. higher loads due to towing or hill climbing. The objective is to offer customers a system with the benefits of the EVT while minimizing these shortcomings, leading to the development of the Two-Mode Hybrid as the focus of the Global Hybrid Cooperation. The Two-Mode Hybrid has an overall level of mechanical content similar to that of a conventional automatic transmission, yet the Two- Mode Hybrid is capable of both CVT action and full hybrid functions. The modern automatic transmission (such as the one pictured) is one of two transmissions concepts which serve as the basis of the Two-Mode Hybrid. Several fixed gear ratios are available in the automatic transmission, which allow several options for engine speed. Its control system selects the best ratio for vehicle performance, comfort, and fuel economy. Its arrangement of planetary gearing and multiple wet-plate clutches allows power to be transmitted from the engine to the wheels at all times, even during shifting. Its torque converter provides a smooth vehicle launch and can ease the transitions between the fixed gear ratios. The electrically variable transmission or EVT is the second of the two transmission concepts serving as the basis for the Two-Mode Hybrid. 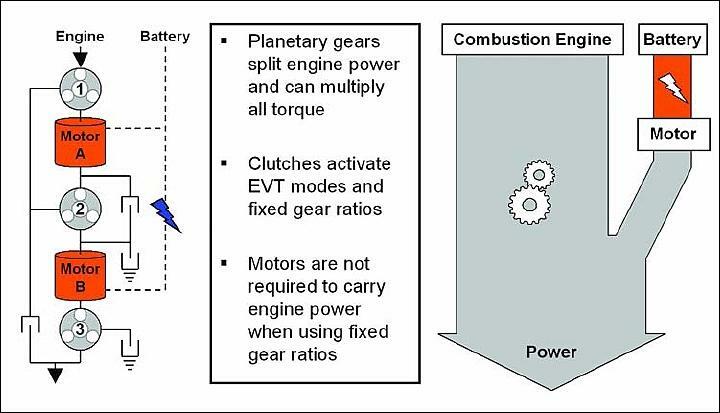 The EVT is a power-split transmission combining planetary gearing and electric motors to provide a continuously variable ratio between its input and output. Historically, each typical EVT has been built with only one mechanical option for its powersplit gearing, known as a one-mode EVT. One-mode EVT development and testing was stopped in the U.S. in 1941, but EVT hybrid concepts appeared in the 1960s and 1970s and eventually entered automotive production in the 1990s [in the NHW10 Toyota Prius] , following the development of electronic motor controls. This diagram shows the core elements of the one-mode input-split EVT concept. The one-mode EVT is currently the most common hybrid system in the market place. It is mechanically simple and contains only one planetary gear set and two electric motors, without clutches. 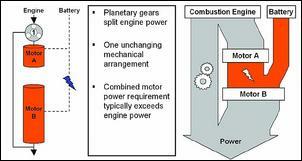 The input power from the engine comes immediately to a planetary gear set. This gearing splits the power through the transmission between a mechanical path and an electrical path. A significant portion of the power flows mechanically through the transmission and is delivered directly to the final drive. The remaining power from the engine flows to the first electric motor. This first motor acts as a generator, changing part of the engine power into electric current. The electric current from this motor can either go into the battery for storage or on to the second electric motor. The second motor changes electric current from the first motor or from the battery back into mechanical power for the output. The input-split EVT arrangement is shown schematically in this diagram. 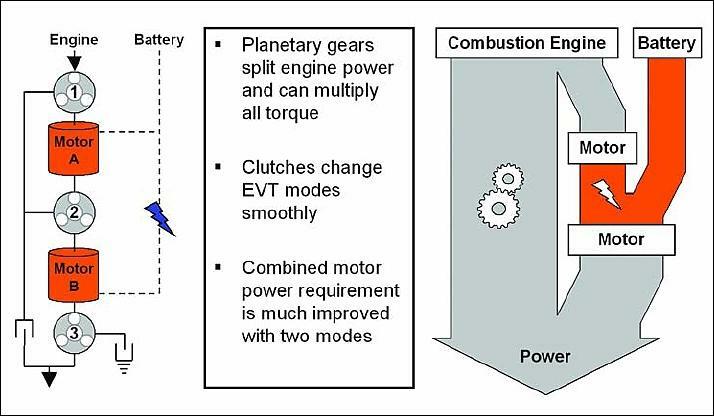 At right shows the power from the engine flowing through both the electrical and mechanical paths of the EVT to the transmission output. The relative sizes of these electrical and mechanical power flows are critical, because electrical path efficiency is typically close to 70%, and mechanical path efficiency is typically greater than 90%. The amount of power that must be transmitted electrically varies with vehicle speed. 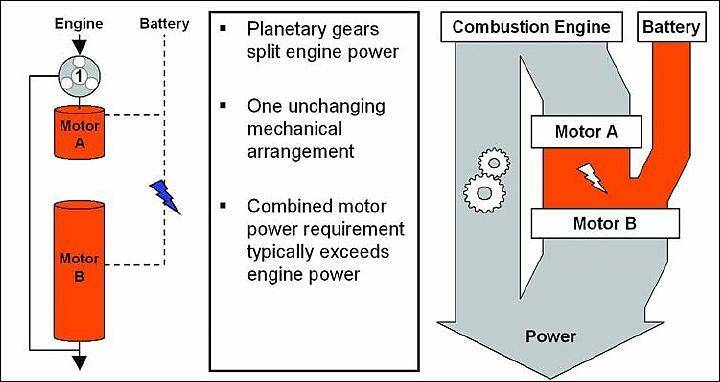 The ratios of the planetary gearing and speeds of the engine and the motors determine the fraction of engine power that is transmitted electrically. In the case of a one-mode EVT, the magnitude of the electrical power can be quite large, driving a requirement for large motors for any given size of engine and vehicle. Typically, the combined power rating of both motors must be more than the power of the engine. The amount of power that must be transmitted electrically with the one-mode EVT is one of its most critical drawbacks, resulting in reduced efficiency, packaging issues, higher mass and increased manufacturing costs for a given level of manufacturing economy. The high requirement for electrical power in a typical one-mode hybrid comes from the fact that there is only a single transmission ratio where the power transmitted through the electrical power path becomes zero. At this ratio, sometimes called the "mechanical point" of operation, the speed of the first motor, which controls the speed ratio through the transmission, reaches zero. With one motor at zero speed, engine power is not transmitted through the electrical path to the output. This one mechanical ratio is a characteristic of the one-mode input-split EVT. This ratio is typically chosen in the design of the one-mode hybrid for high drive-cycle fuel economy. This forces a compromise, and results in significant power loss through the electrical path, and ultimately lower transmission efficiency, at all other transmission ratios. The impact of this inefficiency is typically more pronounced at higher speeds and with higher load conditions found in "real world” driving. The one-mode hybrid has only proven successful in small to mid-size vehicles carrying light to moderate loads. As the vehicle size and load rating increase, the electric power flow and the torque necessary for appropriate output become heavy burdens. The motor components, especially the motor connected to the output is very large, heavy, and costly for larger, more powerful vehicles. For larger vehicles, the one-mode EVT is capable of using reasonably-sized motors only with additional mechanical gears. 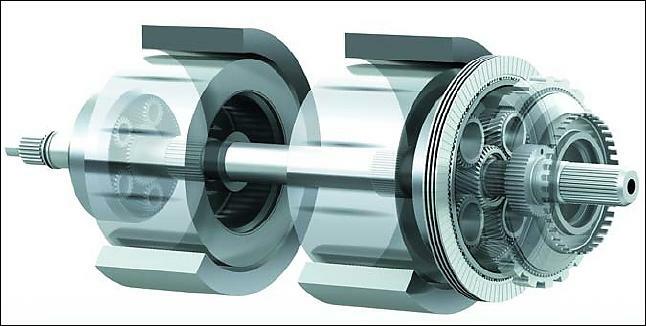 One very simple way to apply additional gearing is to provide two-speed gearing for the larger motor which is connected to the output. This arrangement requires a pair of clutches and another gear set. This diagram displays the core mechanical elements for a one-mode hybrid with two-speed motor gearing. With the exception of reducing the maximum torque and speed for one motor, this two-speed gearing does not change the operation of the one-mode hybrid. 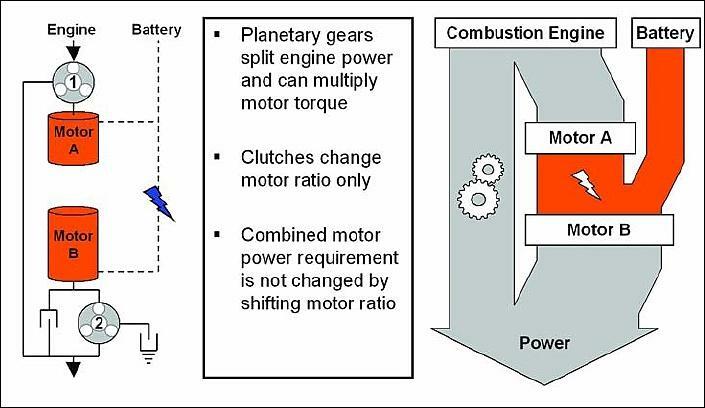 The power being transmitted by the motors is not reduced because there remains only one mechanical relationship between the engine and output. The two-speed gearing changes only the relationship of one electric motor to the output. 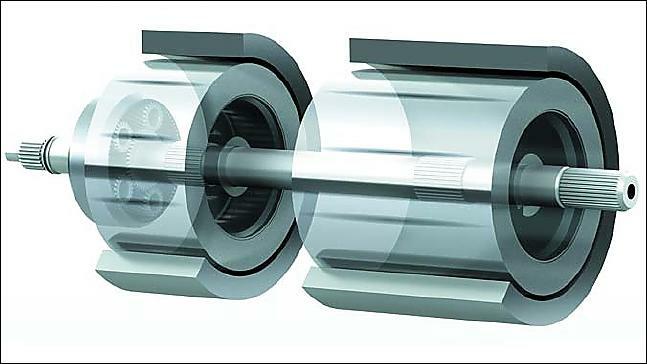 The two-speed motor gearing can be designed for shifting near the mechanical ratio, but still requires a sharp change in the speed of the motor during the shift. The one-mode hybrid with two-speed motor gearing is shown schematically on the left of this diagram. The critical power flow is shown on the right. This power flow is identical to that of the earlier one-mode hybrid concept. The Two-Mode Hybrid addresses all of the issues of the one-mode hybrid by adding a second EVT mode. This second mode is a compound-split EVT mode. 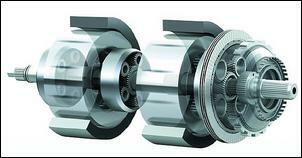 This is accomplished by adding a planetary gear set to the one-mode hybrid with two speed output gearing. The Two-Mode Hybrid is shown in this diagram. In the Two-Mode Hybrid, the two clutches provide a torque advantage for the motor at low speeds while fundamentally changing the power flow through the transmission. When the first clutch is applied and the second clutch is open, the system operates as an input-split EVT as described earlier. 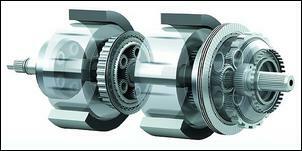 When the second clutch is applied and the first clutch is released, the system operates as a compound-split EVT. The Two-Mode Hybrid can shift between these two EVT ranges in a synchronous shift, involving only torque transfer between elements without sharp changes in the speeds of any element. The Two-Mode Hybrid is displayed schematically here on the right. The combination of a compound-split EVT range and an input-split EVT range enables a Two-Mode Hybrid system with electric motors sized for hybrid functionality and provides for more efficient high speed cruising the size of the electrical power path, as compared with the one-mode hybrid. 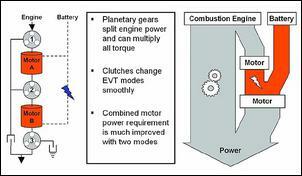 In the two-mode hybrid, the amount of power transmitted electrically varies with vehicle speed or transmission ratio. The two-mode hybrid has an input-split EVT range with a ratio when power through the electrical path from the engine to the output is zero. It also has a compound-split EVT range with two more of such ratios. The result is that the two-mode hybrid spans a wide range of transmission ratios maintaining relatively low power through the electrical path. The first of these three mechanical ratios or mechanical points can be utilized to maintain moderate electrical power under acceleration, while another point can be used to optimize efficiency during high speed cruising such highway or autobahn driving. The highest overall efficiency results from channelling the maximum amount of mechanical power while retaining full hybrid functionality. This approach reduces both the electrical losses and the size of electric motors necessary. The one-mode hybrid requires relatively large motors just to transmit engine power to the output. Adding a compound-split EVT range reduces the need to transmit power electrically and enables properly sizing the motors for the needs for regenerative braking and power assist. The input-split EVT range and compound-split EVT range allow continuously variable engine speed and full hybrid functionality throughout the vehicle speed range. In addition to these two EVT hybrid modes, four fixed gear ratios enable parallel hybrid operation with electric motors used only for boosting and braking. This parallel hybrid operation is possible by simply using two additional clutches. The mechanical core for this Two-Mode Hybrid transmission is shown in this diagram. As a result, this Two-Mode Hybrid can operate as a robust CVT or it can select a fixed gear ratio, offering advantages in fuel economy, comfort and performance. Operating in the fourth fixed gear ratio as a parallel hybrid provides the opportunity to power down one of the motors for highest steady-state cruising efficiency and to use the other for electric boost, supplying accessories and for regenerative braking. Operating in the other fixed gear ratios enhances acceleration, hill climbing and towing by enabling mechanical power flow from engine to output, while the electric motors are in parallel and devoted to electric boost or regenerative braking. For first and third gears, both motors are available up to the limits of the battery capacity. The Two-Mode Hybrid is displayed schematically on the left of this diagram. The important additional option of parallel hybrid operation, when engine power flow is supported entirely by the mechanical gearing, is shown on the right. Continuously variable ranges cover all vehicle speeds allowing smooth operation with moderate acceleration for a comfortable driving experience. The combination of variable ranges and four actual fixed gears provide strong multiple-ratio acceleration for a sporty driving experience. Overall, the Two-Mode Hybrid offers General Motors, DaimlerChrysler, and BMW Group customers an optimal combination of performance, fuel economy and comfort in compact, efficient packages. Motor peak and continuous power are reduced by the options of operation in input-split, compound-split or fixed gear parallel-hybrid operation. 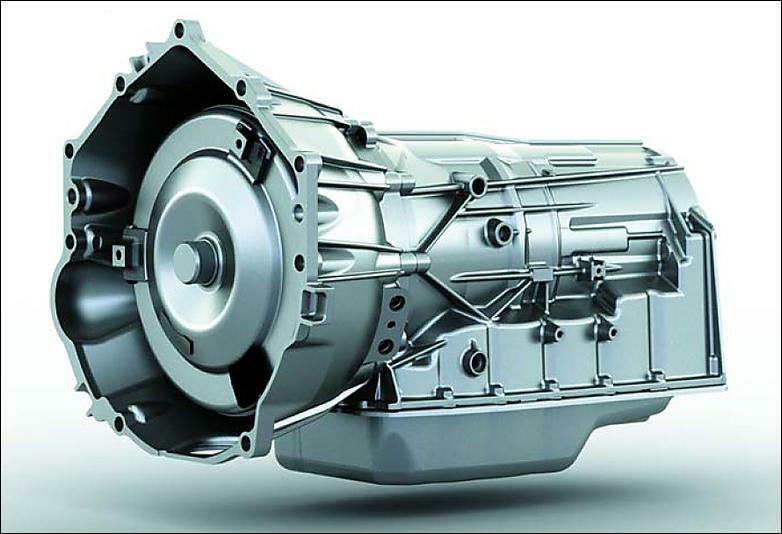 The fact that motor size is not only smaller but less dependent on engine size enables a more conventional and smaller hybrid transmission package and allows the Two-Mode Hybrid to be offered on a wider range of vehicles while reducing overall system cost. The first Two-Mode Hybrid to be offered for sale by the Global Hybrid Cooperation will be for rearwheel- drive SUV's and other full-size trucks. 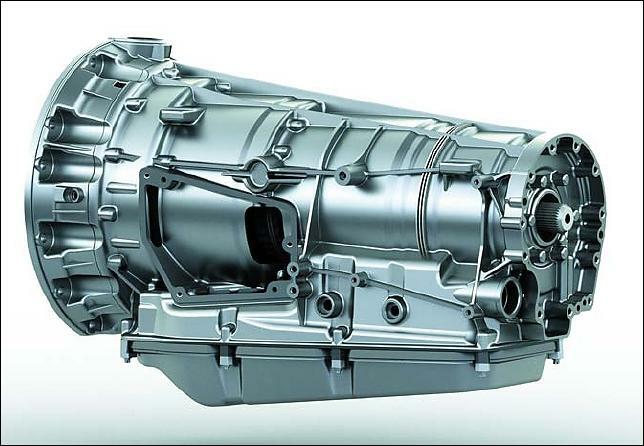 This transmission will be featured in General Motors and DaimlerChrysler vehicles, starting in 2007 with the 2008 Chevrolet Tahoe followed shortly after by a Dodge Durango. 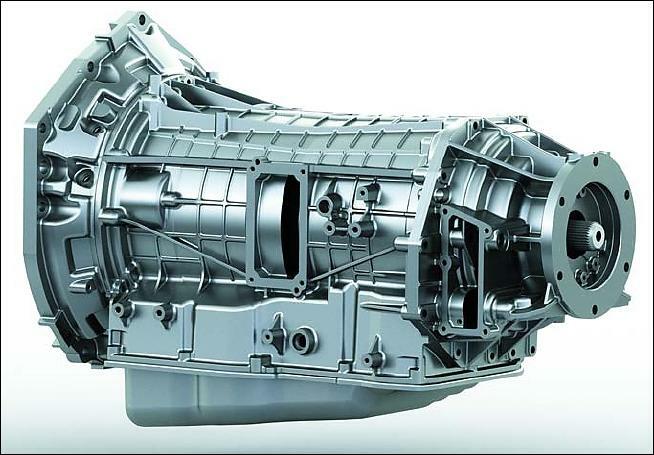 This photo displays the exterior of the Two-Mode Hybrid transmission for rearwheel- drive trucks, which will be installed with large North American V8 truck engines. Each of the members of the Global Hybrid Cooperation will also be offering a more compact Two-Mode Hybrid transmission for rear-wheel-drive luxury cars and other vehicles which require a more compact transmission. 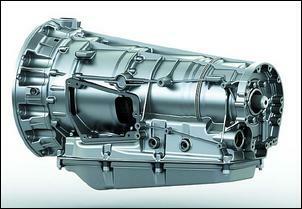 This transmission will be featured in a variety of General Motors, DaimlerChrysler, and BMW Group vehicles. Although the Two-Mode Hybrid design will be jointly developed, the hybrid drive-train system will be integrated into the vehicles by the manufacturers taking into account the brand specifications. Hybrid vehicles will become one of the cornerstones of future mobility. The two mode hybrid is already available in GM-Allison powered buses.